Prince Edward Island, Canada's smallest province, is just a quick flight or a scenic drive away from Boston, Mass., and New York City. 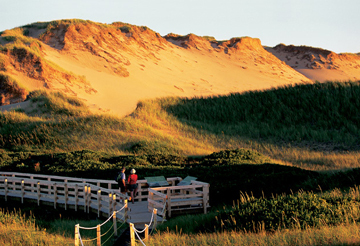 Plan to walk the beaches and dunes at Prince Edward Island National Park, as shown here. All photos are by John Sylvester, courtesy of the Government of Prince Edward Island, Canada. You may think that the last snapshot you want creeping into your daydreams of winter escapes is Canada. Ban all dark thoughts of ski masks and arctic winds, however. Instead, imagine a cozy emerald-green quilt trimmed with silky sand dunes, beribboned with quiet red-clay roads, and dotted with quaint farms and picture-perfect lighthouses. 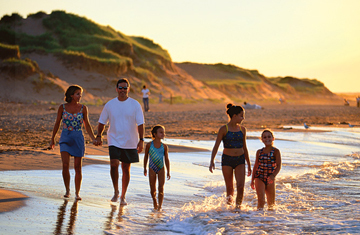 Now plan to spend your rejuvenating retreat or family vacation this summer at Prince Edward Island. The island, which hugs Canada's east coast, is the country's smallest province, measuring roughly 280 kilometers lengthwise and a slim 65 kilometers at its widest point. Increasingly popular among American tourists, the crescent-shaped island off the coast of Nova Scotia in the Gulf of St. Lawrence enchants nature-lovers and eco-adventurers with its idyllic landscape. Two of the more interesting natural treasures on the island are Greenwich Dunes and Prince Edward Island National Park. Located on the northeastern shore of Prince Edward Island, Greenwich Dunes is a 70-kilometer drive from Charlottetown, the capital of the island, and well worth the visit. Greenwich Dunes is a 900-acre area internationally known for its unique dune system, extensive variety of plant and bird species and significant Aboriginal and Acadian archeological sites. Blown by prevailing winds, these relatively undisturbed dunes migrate in the direction of the forest at a rate of 2 to 4 meters per year leaving behind a series of counter-ridges, or Gegenwalle, the only landform of its kind in North America. This migration first buries and then exposes once-buried woodland, creating exhumed skeleton forests such as those at Blooming Point. Another distinguishing feature is the 300 species of plants and animals, some of which are endangered, that inhabit the marshes and woodlands of Greenwich Dunes. Visitors will find Greenwich Dunes, a 900-acre area internationally known for its unique dune system, on the northeastern shore of Prince Edward Island. Hikers should stick to the trails that run through the dunes to avoid disturbing the fragile ecosystem. Artifacts discovered in the 1980s suggest that Greenwich Dunes is also rich in human history. Remains such as hunting instruments and building foundations indicate the existence of at least six cultures ranging from ancient Aboriginal presence 11,000 years ago to Acadian and Scottish habitation in the 18th century. Scientists are mapping the ocean floor where a land bridge may have existed 11,000 years ago linking the island to the mainland. Various artifacts found under the sea and on land are helping researchers learn more about this region's past. Identical animal and plant fossils discovered along the coastlines of the Northumbrian region (Prince Edward Island, Nova Scotia and New Brunswick), as well as evidence of glaciation and exposed continental shelf off Nova Scotia, indicate that such a land bridge existed. And further evidence of past cultures found in this region includes distinctive stone tools that are made of materials from a variety of geological sources present throughout Northumbria, suggesting travel within the area. For thousands of years, glaciation has changed the geography of Prince Edward Island, and today, the island is quite vulnerable to climate change. A 30-centimeter rise in sea levels over future generations, such as suggested by the Intergovernmental Panel on Climate Change, would result in the loss of approximately 30 meters of island shoreline. Just a few kilometers away from the dunes is Prince Edward Island National Park, which has a very appropriate theme: "sea, people and the changing landscape." Stretching 40 kilometers along the island's northern coast, the park protects red sandstone cliffs, offshore bars, submerged estuaries and popular beaches once frequented by early native people and European settlers. The park also boasts forests, although from the early 1700s through the early 1900s, 52 percent of the island was cleared for agriculture, timber export and shipbuilding, leaving genetically inferior trees. Remnants of Acadian forest survive in corners of the park, however, in places with delightful names such as Balsam Hollow Trail. The park is also home to remnants of earlier cultures, people who relied fully upon and struggled over land and sea for their survival and prosperity. A burial site discovered within the park is evidence of early presence of the Mi'kmaq people in this area, who called the island Abegweit or "land cradled on the waves." The French, who were the first of the European settlers, and Acadians from Nova Scotia fleeing British oppression also inhabited what is now park land. When the French forfeited Prince Edward Island in the 18th century, the British deported 3,400 Acadian residents and 700 of them perished at sea. Three hundred determined Acadians evaded the British, however, and returned to the island to establish fishing and farming communities. For an eerie bit of romanticism, visit the Stanhope Cemetery in the park, one of the oldest pioneer cemeteries on the island. One of Prince Edward Island's most famous landmarks is the Green Gables House in Cavendish, made famous by Lucy Maud Montgomery's Anne of Green Gables children's books. Today, visitors can walk the grounds and visit the farmhouse. 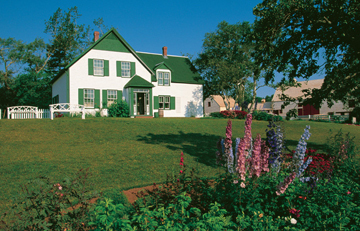 Arguably, the queen bee of park attractions is the Green Gables House in Cavendish. This quaint farmhouse inspired the setting of Lucy Maud Montgomery's Anne of Green Gables novel, which secured Canada a spot on the map of beloved children's literature worldwide. Not just a literary landmark, Green Gables also embodies the cultural climate and lifestyle of the average island family of the late 19th century. Prince Edward Island celebrates Lucy Maud Montgomery's legacy with many Anne-inspired activities and performances. Getting to Prince Edward Island to experience the natural and historic beauty is simple. You can fly into Charlottetown directly from Toronto, Montreal or Halifax, as well as Detroit and some other major U.S. cities. Or if you're up for a road trip, you can drive: Prince Edward Island is roughly 1,600 kilometers from Toronto, 1,000 kilometers from Montreal and 1,100 kilometers from Boston. The ferry ride from mainland Canada at Caribou, Nova Scotia, to Prince Edward Island, landing at Wood Islands, is charming. Once you're on the island, you will want to rent a car if you didn't drive your own. Before setting out, be sure to pick up or print out a "scenic drive" pamphlet, which will help make sure you don't miss anything on your tour. Given that some of the earliest European inhabitants of Prince Edward Island were Scottish, it's probably not a surprise that golf is a popular activity. 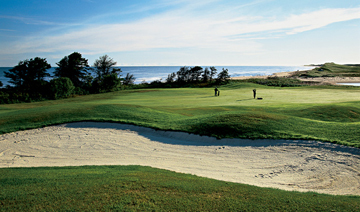 The island hosts at least 30 golf courses, including this one at Crowbush Cove. From Wood Islands in the south, drive northward to Souris, East Point and Kensington. Take the side roads for a scenic ride to enjoy trademark rolling hills of the island's verdant countryside, patchwork fields of golden grain, red cliffs and pink sand beaches. Have one of the island's famous lobster dinners at New Glasgow. Enjoy a round at the much acclaimed Glasgow Hill Golf Course (one of 30 golf courses on the island). Stop at North Rustico to walk the boardwalk through this fishing village. Pay homage at Green Gables and visit Dalvay-by-the-Sea, an elegant Victorian mansion used as a summer home by American industrialist Alexander MacDonald. And don't forget to visit one of Prince Edward Island's countless photogenic lighthouses along the way. Those with more adventurous tastes can enjoy nature trails, deep-sea fishing, and kayaking tours. Trains no longer course through the island, but the former head-to-toe railway line, Confederation Trail, is now a hiking and biking trail. The varied Prince Edward Island scenery offers something for everyone. Discard your inhibitions and play like a child at the sand dunes. Take a dip at the quiet beaches of Cavendish, Brackley, Greenwich, Cousins Shore or Blooming Point. No frozen toes here, because warm currents, shallow depths and sandbars keep the water surprisingly comfortable (up to 75 degrees in July). A visit here makes it easy to understand the aboriginal name for Prince Edward Island, "land cradled among the waves." With a bounty of natural beauty by land and by sea, the island has a lot to offer the outdoor enthusiast, naturalist and history buff alike. Stemp is a freelance writer who loves to travel and explore the land around her wherever she goes.